This is our favourite destination in Golfo Dulce and no matter how many times we visit, we continue feeling enchanted with this magical habitat. The mangrove systems found within the gulf, which include red and black mangrove species, grow in the intertidal region where salt and fresh water meet. They serve as a buffer from storms reducing erosion of our shorelines and improve the quality and clarity of the water. The mangroves are a crucial nursery for shrimps, crabs, corvina (sea bass) and especially endangered hammerhead sharks that live around Isla Del Coco when adults. A great variety of other animals reside within this habitat, including caimans, snakes, monkeys, iguanas, and around 100 species of birds, including the endemic mangrove hummingbird. You will depart in our boat just before high tide, making a beautiful journey across the gulf on which you may be Iucky enough to make an encounter with resident dolphins or even whales (August and September). Upon arrival at the mouth of the Esquinas river, pelicans perch amongst the mangrove trees and the boat cruises along mirror smooth waters bordered by green canopies and hanging mangrove seed pods. To delve deeper in between the stilted roots of the forest, you will take the kayaks up the narrow creeks. 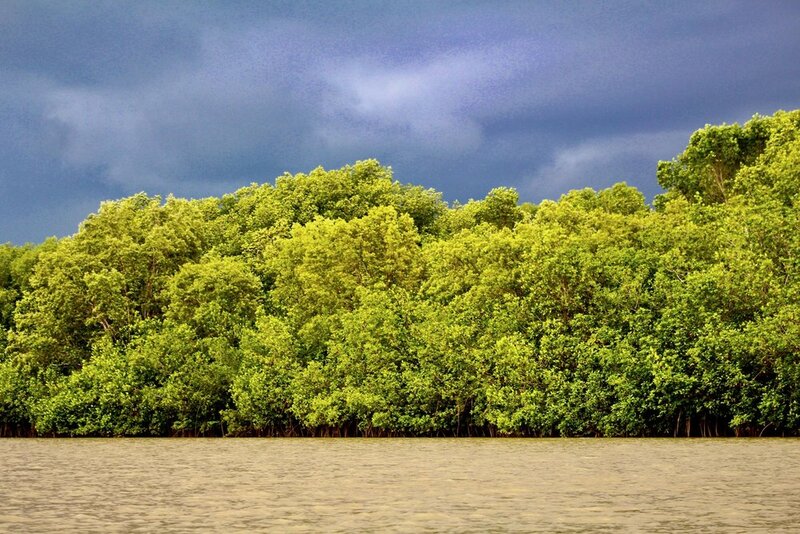 Colourful bursts of mangrove crabs scuttle along roots and herons perch in the branches. Keep your eyes peeled for caimans and turtles in the waters below, basilisks (also known as Jesus Christ lizards for their ability to walk on water!) dashing over the surface and monkeys in the canopies above. This is also a preferred habitat for the two-toed sloth, but its perfect camouflage and its preference for living high up in the canopy make it a challenging sighting. Top this unforgettable day with a refreshing swim in one of Golfo Dulce’s emerald bays on the way back to the Retreat. The tour lasts 4-5 hours and costs $85 per person ($45 per child). We require a minimum of two adults in this trip. With the help of our visiting biologists from Cambridge University we have put together an infographic about Golfo Dulce's Mangroves which will tell you a bit more about this very important habitat.